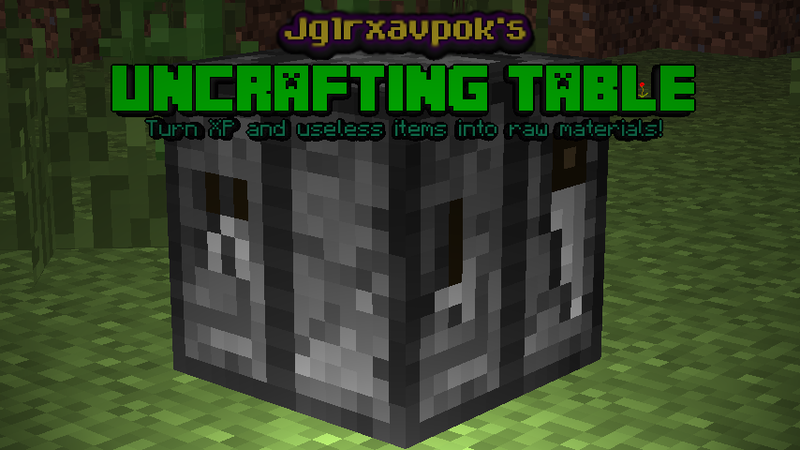 This mod adds an Uncrafting Table which allows you to convert unwanted items back into the resources they're crafted from, in exchange for XP. Uncraft items from vanilla Minecraft or other mods! Includes support for Applied Energistics, IndustrialCraft, Mekanism, Thermal Expansion, Tinker's Construct and many more, as well as recipes added by MineTweaker and CraftTweaker. Uncraft tools, weapons and armour - even if they're damaged! Choose between two different ways of uncrafting damaged items - either get all the resources back in exchange for lots of XP, or get some of the items back depending on how damaged it is. Can now return partial materials using nuggets as well as full ingots or gems! If the item is enchanted, you can get the enchantments back by adding books to the table as well! Split the enchantments onto separate books, or keep them all on one book! You what? Do you want to be able to uncraft items which can't be crafted, like horse armour? Well now you can! The mod includes recipes for horse armour, saddles, and partial returns on damaged anvils. You can also add your own using the CraftTweaker integration. Don't like the XP cost? Don't want to use nuggets? No problem - the mod comes with a configation menu to decide which features you want to use. You can also add a list of items you don't want to be able to uncraft, and you'll not be able to uncraft them. And if you want even more control, the mod provides several custom functions that you can access using CraftTweaker scripts. See the wiki for more details. 16x16 textures too low-res for you? Check out the new Faithful x32 resource pack to accompany the mod! Available on Curse and CurseForge. Is it possible to make an unsmelting table? Or how about a few modded crafting types? Like, Tinker's Construct or Project Red? Just a thought. Does your mod uncraft 100% of Vanilla/moded items please ? Please will there be an update for 1.13? I bet there will be, just wait for Forge to update, "No Forge = No Complex Mods"
I'm surprised forge seems to be taking so long. It must be a huge project! forge is so long because the 1.13 changed many important code. A must have. Gives sense to fishing farms and enchanted mob drops. Now you can collect all those fine enchantments and put them there where needed. ... and it can make you really rich by uncraftng modded seeds! I cant even craft the table. I put the table in the middle and surround it with cobblestone and nada. Also when I click on the empty slot where the table should be, my game crashes. Any ideas? Thanks. It sounds like you have a mod which is interfering with the crafting table. Nobody else has reported a problem with the crafting recipes for this mod or with their crafting table crashing when clicked on. As you've not provided a crash log or even told me which Minecraft version you're using I don't think I can offer any more help. Could you please use the file naming convention that almost all mods use? I hate it when your mod starts with "U" and shows at the top of my list! By the way, I love this mod, and the ways it changes my playstyle. Scavenging has a purpose now. There's a way to disable uncrafting recipes and leave only the unenchanting part? No, but you might be interested in The Disenchanter Mod by Impelon. Why isn't this more popular!? A button to sweep all the uncrafted components form the grid to my inventory. well well... using this right now and I have to say, this is a life saver, but to be honest, I think the recipe is WAY too cheap as it is right now. The uncrafter, would require the crafting table surrounded by something hard, but not too hard such as gold, or quartz, and does not removes enchantments, just uncrafts. the unenchanter, would require the enchanting table on top, uncrafter in the middle, with something a little harder, such as blaze powder, since this is magic we are removing!!... MAGIC!! Maybe this kind of crafting could be an alternate difficulty in the config, to please the crowd that already has this simple version, jajaja. but overall... great addition to the game.